Port Adelaide has bounced back after a poor loss to Essendon last week and exhibited its offensive power, with 11 individual goal kickers and 22 more forward 50 entries than Brisbane in a 40point win. In another impressive performance, Dayne Zorko has amassed 24 kicks and 826 metres gained across the match (the fourthhighest tally of any player this season). 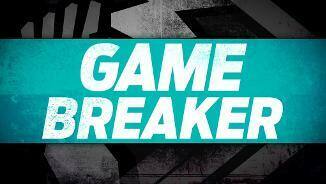 Port Adelaide has kicked 10.2 (62) since half time and now 11 individual players have kicked goals for the Power. Prior to this match the Power averaged 9.5 individual goal kickers per game, the highest average of any team in the league. Lions InterchangeNick Robertson off due to an injury. Brisbane delivered the ball inside forward 50 on five consecutive attempts without a goal and now the Power have capitalised with a goal immediately at the other end. This is the Power's seventh goal launched from intercepts since half time. Power InterchangeJared Polec off due to an injury. Lions InterchangeJake Barrett off due to an injury. Dayne Zorko has surpassed his season average of 26.5 disposals per game in kicking a wonderful snap goal for his second major. The Lions midfielder has amassed gamehighs in disposals (27), tackles (10) and pressure acts (26). 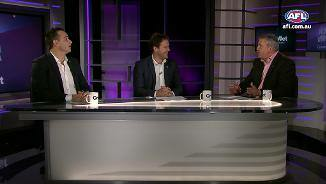 Paddy Ryder has been a weapon for Port Adelaide in the ruck and up forward. Ryder has won 37 hit outs (with 12 to advantage), five clearances, delivered the ball inside 50 on five occasions and now kicked two goals. Eric Hipwood has showed promising signs for Lions supporters. The 14th selection in the 2015 National Draft didn't register a disposal in the first quarter, but since then has taken three marks and kicked 2.1 (13) from nine kicks. Port Adelaide set up its quarter with seven more centre clearances than Brisbane, allowing it to retain the ball inside its forward half for 63 per cent of the term and kick six goals. The Lions made the most of just eight inside 50s with four goals. Ryan Bastinac has kicked a bag of three goals in a game for the second time this season. The exKangaroo has impressed all over the ground, with 19 disposals and six intercepts to go with his three majors. Sam PowellPepper has launched a goal on the run from well inside the centre square, his second major for the night and 11th for the season. Five of his goals this season have been kicked from outside 50 metres, the highest tally of any Power player. Brisbane has remained competitive this term through high efficiency, kicking three goals from only four forward 50 entries. 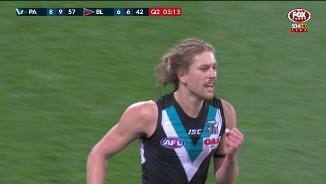 This number has been kept low through Port Adelaide's dominance at the restart, winning all but one centre clearance. Port Adelaide has improved its conversion since half time with five goals from five shots this quarter (with four of these set shots). Robbie Gray has been involved in four of these passages, with three goal assists and one major himself this quarter. Robbie Gray has equalled his personal best of six marks taken inside forward 50, the fourth time in his career he has taken that number in a game. With Brisbane's third goal directly from a free kick for the game, Harris Andrews has kicked just his eighth goal in his 48game career. Port Adelaide has been incredibly efficient to start the second half, kicking three goals from four forward 50 entries and only 16 disposals. The Power have won five of the six clearances in the early stages this term. Chad Wingard has snapped his second goal for the match to go with his four clearances and ten disposals. He averages 23 disposals and eight score involvements per game against the Lions, his best averages against any side across his career. 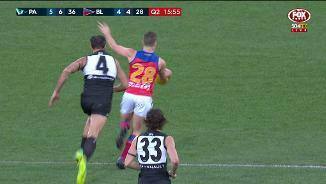 The second half has started in a similar vein to the first, with Port Adelaide launching its sixth goal from clearances and Brisbane doing likewise with its sixth from intercepts. Five of these intercepts by the Lions were won in the midfield. Brisbane looked competitive for most of the quarter but two goals to Port Adelaide in 'time on' levelled the term. The Lions were cleaner (with four fewer turnovers from 19 more disposals) but the Power were stronger from stoppages (six more clearances). Port Adelaide dominated Brisbane during 'time on' in both quarters, recording a combined 15 more forward 50 entries and outscoring the Lions by 26 points after the 20minute mark of both terms. Patrick Ryder has completely dominated in the ruck to half time, winning 31 hit outs (equal to his first half personal best) with 11 of those have been to advantage (his secondbest tally in a first half). Port Adelaide is finding an avenue to goal through forcing stoppages inside its forward half. The Power have now won nine clearances ahead of centre, with all ending inside 50 and resulting in 4.1 (25). Dayne Zorko has again been one of Brisbane's better players in the first half with six score involvements and a gamehigh 379 metres gained. He is ranked 16th and second respectively in this metrics across all players in the league this year. Robbie Gray has taken all but one of Port Adelaide's five marks inside forward 50 but missed three of his four set shots. 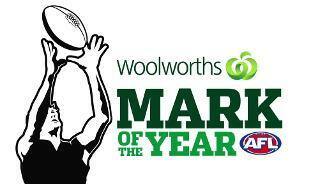 The Lions have just taken two marks inside forward 50. With the free kick and goal to Ryan Lester, Brisbane has now kicked 2.1 (13) and Port Adelaide 1.3 (9) from free kicks. Both are tracking well above the league average per team per game this season, of under three shots per game from free kicks. Primarily through Patrick Ryder (17 hit outs with six to advantage), Port Adelaide has dominated in the ruck with 19 hit outs to two. As a result the Power have now launched three goals from their ten clearances, following the goal to Hartlett. Although Brisbane trails, it looks to be the cleaner team particularly in its forward half, with kicking efficiency in that zone of 60 per cent compared to Port Adelaide's 45 per cent. Stefan Martin has just registered his first disposal for the match. In an entertaining first term, both teams found scoring opportunities relatively easy to come by once inside 50. Port Adelaide had the ascendancy with the ball in its forward half for 67 per cent of the term, but only kicked five goals from 12 shots. Robbie Gray has taken three marks inside forward 50 in the first quarter and just before the siren has kicked his first major. 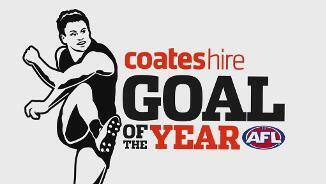 This season Gray is ranked first for goals and score assists at Port Adelaide. The Power will be rueing their conversion from set shots this term, with 1.5 (11) and one complete miss from seven set shots. In 2017, Port Adelaide has converted with 51.9 per cent of its set shots (ranked ninth in the league). 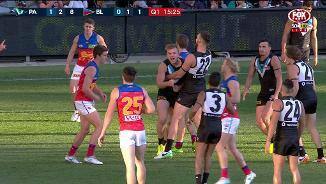 Charlie Dixon has kicked Port Adelaide's fourth goal after Harris Andrews was penalised for holding. The Lions have already conceded four free kicks inside their defensive half and from the resulting shots the Power have kicked 1.3 (9). Brisbane has bounced back strongly in the past ten minutes, heavily capitalising on poor disposal by Port Adelaide. The Power have turned the ball over four times in their back half and as a result the Lions have launched three goals directly. It has been a competitive start for Brisbane everywhere but the scoreboard and now Ryan Bastinac has found some reward for effort with a goal from well outside 50 metres. This is just his third goal from outside 50 metres in his 149game career. Port Adelaide is away to a quick start, with three early goals all kicked from snap shots in general play. This season the Power averages 28 per cent of its scores from snap shots, the second highest percentage of any team in the competition. Port Adelaide have transitioned from the kickin to Wingard goal without Brisbane touching the football. In 2017 the Power averages a score directly from just 7.6 per cent of their kick-ins, ranked 12th of all teams in the league. 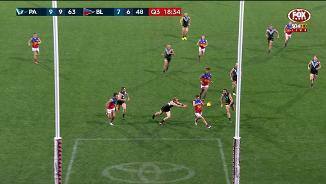 Ollie Wines has kicked the first major for the game after winning his own clearance from a ball up inside forward 50. This season Port Adelaide outscores its opposition by 4.9 points per game from scores launched from ball ups (ranked second). Some poor set shot kicking from noted goal kickers to start the game, with Dayne Zorko (16 goals in 2017) and Robbie Gray (27) goals) missing a total of three set shots from within 40 metres. This match features the strongest and weakest teams this season in terms of field position. Port Adelaide averages a differential of 8:17 time in forward half this season (ranked first) while Brisbane averages12:57 for the same metric (ranked last). 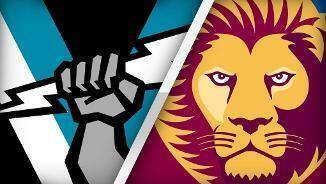 In the 33 encounters between these sides, Port Adelaide's 16 victories just shades Brisbane Lions which has won 15 matches (two games were drawn). The Power have won the last three games against the Lions by an average of 85 points. Further, the Power has been the most potent team from stoppages, averaging 18 points per game more than their opposition from clearances (ranked first) while the Lions concede a net 14 points per game to their opposition (ranked 17th). Welcome to Adelaide Oval for the Port Adelaide v Brisbane Lions Round 13 clash. 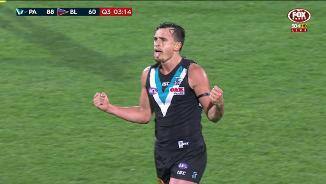 PORT Adelaide has returned to the top four with a 40-point victory against the Brisbane Lions at Adelaide Oval on Saturday. The Power were made to work hard for their seventh win of the season, but did enough to bounce back from last weekend's 70-point flogging at the hands of Essendon. 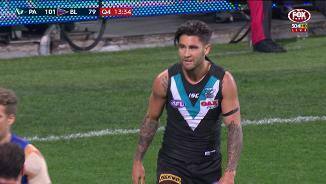 Ollie Wines and Robbie Gray were outstanding, Paddy Ryder had a huge game in the ruck and Chad Wingard kicked three goals as the Power won – 18.13 (121) to 12.9 (81) – in front of a crowd of 31,772. 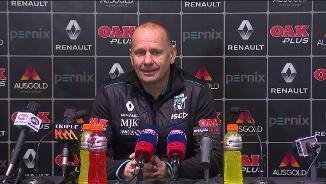 "It certainly wasn't our absolute best performance, but by the end of the day, we found a way to win by 40 points against a side that has improved a fair bit since the last time we played them," Power coach Ken Hinkley said. "We made some mistakes, they made some mistakes, but to come out at the end of the game with a 40-point victory, you've just got to move on. "We're just in that patch where we're not quite at our absolute best, sometimes it's opposition-driven, sometimes it's us, we're just a tiny bit off-sharp. "We had been sharp for a big part of the year, but we're a tiny part off-sharp." Dayne Zorko was immense for the improving Lions, continuing his purple patch of form with 32 possessions, 12 tackles and two goals. 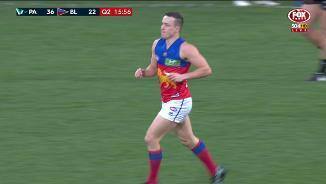 The Lions were far more competitive than their previous visits to Adelaide Oval, as well as their 83-point loss to the Power at the Gabba in round six this year. 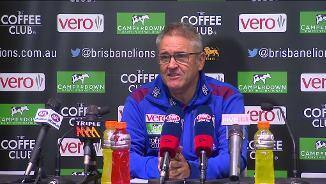 "To cut that margin in half to 40 points is a positive for our group with where we are at," Lions coach Chris Fagan said. "The pleasing part about it is we were well and truly in the game probably until the last five minutes when it blew out a little bit. "But (Eric) Hipwood kicks that goal in the last quarter, I think the margin was about three and a half goals, and we were some sort of chance. "If we were a bit more experience and had a bit more poise, we might have been able to make them a little bit more nervous than we did, but it was still a pleasing effort and one we'll learn a lot from." 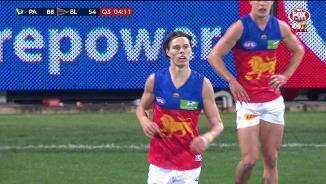 Power winger Jared Polec left the ground in the last quarter grabbing his hamstring and is likely to miss two to three weeks. The Power booted the first three goals of the game, but couldn't shake the scrappy Lions in the opening quarter. Gray used his body superbly to out-mark Darcy Gardiner in the goalsquare to extend the Power's lead to 15 points at quarter-time. Ryder was having a field day against the Lions' ruck combination of Stefan Martin and Archie Smith. The Power had a dominant advantage in hit-outs (16-1) in the opening term, while their tackling pressure (with 20 tackles to 11) was also elite. But the Lions - full of confidence after ending a nine-game losing streak with a 57-point win over Fremantle last week - showed plenty of character to close to within three points in the second term. Goals to Sam Powell-Pepper and Aaron Young – recalled to the side after 36 touches and five goals in the SANFL last week - restored the Power's 15-point buffer – 8.9 (57) to 6.6 (42) – at half-time. The Power had the edge in contested possessions (83-75) and inside 50s (36-24) to go with the one-sided display in the ruck (35 hit-outs to six). But the Lions composed themselves and played an effective high-possession game, having 51 marks to 22 in the first half and 25 more uncontested possessions. The Power put the Lions on the back foot immediately at the start of the third quarter. Spectacular goals came from both sides - Eric Hipwood turning on the afterburners in the forward pocket, Powell-Pepper going bang from inside the centre square and Ryan Bastinac snapping around his body. The Power took control of the centre clearances, winning nine to two, and were efficient in attack with 6.1 from 17 inside 50s to take a 28-point lead into the final term. Port Adelaide: Winger Jared Polec left the ground grabbing his hamstring late in the game and is likely to miss two to three weeks. Apart from that, it was a clean bill of health for the Power. 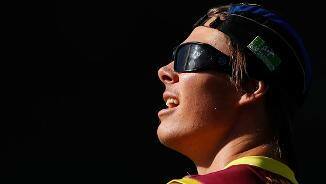 Brisbane Lions: Jake Barrett and Nick Robertson left the ground late, but the club couldn't confirm their injuries. The Power will be hoping to consolidate their top-four spot when they take on Collingwood at the MCG next Saturday, 1.45pm AEST. Meanwhile, the Lions face another big challenge when they host Greater Western Sydney at the Gabba next Saturday, 4.35pm AEST.